Appreciating Pixar’s The Incredibles 2 really is all about perspective, and that perspective comes only after experiencing the giddy nirvana of watching the first Incredibles movie. Going into the sequel, I was prepared to forgive it for not quite living up to the original, but would not forgive if it did not remain true to the spirit of the original. I’m fairly easy to please in this regard given that the spirit of the original was such a unique and wonderful thing. The Incredibles also imbues life into drab-yet-true hetero-normative stereotypes which, in the time since the movie’s release, have suffered a beating from the cultural Marxist bullies who have pretty much taken over the schoolyard of mainstream America. You have Bob Parr/Mr. Incredible (Craig T. Nelson), a middle-aged man who’s getting a bit wide in the waist and constantly reliving his glory years. You have Helen Parr/Elastagirl (Holly Hunter), the wife and mother who’s being stretched too thin. You have Violet (Sarah Vowell), the shy girl who wishes she could just disappear. You have Dash (Spencer Fox), the hyperactive boy who’s always getting into trouble. And you have Lucious Best/Frozone (Samuel L. Jackson), the black man who’s as cool as ice. These stereotypes endear because we have seen them many times in life, not just in the movies. But when placed within The Incredibles universe, they take off, becoming avatars of type and bristling with life and energy. Each Incredible acts as an individual, but as a group they conform to a family unit, with all the bickering and emotional issues that families must deal with in order to survive. As much as anything, The Incredibles celebrates the sanctity of family and the love that keeps it all together. Such unabashed traditionalism was certainly edgy back in 2004 for a mainstream movie. What made it more so was how normatively white The Incredibles is. Aside from the very black yet non-threatening Frozone and the racially ambiguous Mirage (who seems to belong on the exotic island to which she lures Bob), pretty much everyone in movie is white. Among the heroes, villains, victims, authority figures, police, newscasters, bystanders, there is only a smattering of blacks (and, curiously, no one who is neither white nor black). The supporting characters are also white, for example, the family’s g-man contact Rick Dicker, Bob’s diminutive Boss Gilbert Huph, Violet’s love interest Tony, and Dash’s school principal. The only exceptions are Dash’s peevish homeroom teacher Bernie, who is quite obviously Jewish, and the stroke-of-genius costume designer Edna Mode (played by Brad Bird), who is based on mid-century Jewish fashion designer Edith Head. But Edna’s unquestioned loyalty to the Parr family enables Bird to utilize positive—or at least neutral—Jewish stereotypes (such as cloying familiarity, good-natured pushiness, arcane sophistication, and a thick urban accent) while eschewing all the negative ones. Basically, it’s a white world, and the non-whites in it really like white people. Another edgy aspect of The Incredibles is the movie’s since-oft-repeated leitmotif: when you say everyone is special that means no one is. This is political incorrectness incarnate and flies in the face of radical egalitarianism which is the primary weapon of the Left. Indeed, The Incredibles not only accepts that people are born with unequal abilities but it champions the few who are truly excellent. When Helen wants Dash to hide his abilities and fit in with his classmates so the family would not incur the wrath of the surrounding normies, Bob—who is the main character and heart of the movie—wants him to stand out as a ‘super.’ It’s the riskier road, yes, but it is also the only road which leads to greatness. I’m sure the ‘fit in’ versus ‘be great’ dichotomy has characterized many individuals and families throughout history and will continue to do so indefinitely. Then toss in a deliciously diabolical villain in Syndrome (Jason Lee), an unstoppable robot monster which brings true menace to the story, and a real slobberknocker of a climactic fight scene, and you have one of the greatest animated films of all time. I will go on to say that that fight scene, all six glorious minutes of it, is the greatest action sequence ever filmed. Whether the film makers realized it or not, The Incredibles struck a blow for the Right in the culture wars, and a brilliant one at that. Of the Pixar franchises so far, we have a mixed bag of sequels. Only Toy Story has managed so far to live up to each preceding movie while keeping the magic which made the original so great. Finding Dory, while charming in its own right, was thin gruel compared to the original, Finding Nemo, which for my money is the Citizen Kane of family movies. But at least Finding Dory basked in its predecessor’s shadow and continued the franchise’s odyssey of friendship, family, and loyalty. The same cannot be said for Cars which turned its exhaust pipes on the magic of the original as soon as it could. Cars 2 became the Mater show in the Far East with a lot of cheap gags and hackneyed action sequences, and Cars 3 was a converged mess with Lightning McQueen absurdly giving up control of his own career to a Scrappy-Doo chatterbox substitute which was as female and Hispanic as she was annoying. Absolutely none of this had anything to do with a holier-than-thou hotshot finding love in a forgotten little town off of Highway 66. Based on the Incredibles 2 trailers, I was hoping for Finding Dory but was bracing myself for another Cars 3. Well, with The Incredibles 2, I’m happy to report we get the former, more or less. This movie shares many of the technical virtues of the original (tight plot, deft dialogue, distinct characters, thrilling action, etc.). The laugh-out-loud humor is there. The retro-future world is there. The soundtrack is there. So is Edna Mode. It even surpasses the original in its use of the Parr’s infant son Jack-Jack who becomes a major player in the story despite never being seen out of diapers (his kick-down, drag-out war with a mischievous raccoon is utter genius, by the way). Thankfully, the sequel also retains much of the normative whiteness of the first film. The sequel’s two new major characters, billionaire Winston Devear (Bob Odenkirk) and his inventor sister Evelyn (Catherine Keener) are white. And the new non-white characters make sense, such as a vaguely Hispanic ambassador and various black and brown superheroes from around the world. None of these characters are American and so threaten the normative whiteness of the film as much as a tourist would. While the sequel adheres to the spirit of the original, what it lacks however is the magic. And it lacks it utterly. Brad Bird, who directed this film as well, decided to retool his story to put Helen at the center rather than Bob. By placing no direct threats to the Parrs as a family like he did in the first film, he dropped any pro-family themes. By having his characters behave so often against type (Helen losing all interest in playing it safe for her family, Bob accepting his role as second banana, Violet becoming extroverted and bossy), he strayed from his earlier hetero-normative stereotyping. He also decided to drop the everyone’s-special-then-no-one-is theme and replace it with . . . nothing. Really, beyond the story’s well-crafted beginning, middle, and end, The Incredibles 2 is about nothing. Whoop-dee-doo. Apparently, Bird and whoever helped him write the script didn’t realize that such lazy-boy feminism is, well, trite. I’d even call it dorky, a beta male’s dreamy idea of an alpha female. It’s ‘You’ve come a long way, baby’ but without the ‘baby.’ Where’s the fun in that? When Helen has a heart-to-heart with Evelyn, they talk about what it means for a woman to take on a man’s role in a man’s world. Only, Helen forgets that when she was taking on the woman’s role as a housewife in the previous film, she had it better than Bob who was enduring soul-crushing tedium working for an insurance company. She was the happy one who resisted change, not Bob. Furthermore, when Helen became Elstagirl in the original, she pulled her weight as much as Bob did. She rescued him on Syndrome’s island, and it was her quick thinking which helped do in the killer robot as well as save Jack-Jack from Syndrome’s clutches in the end. So what’s all this business about it being a “man’s world?” This just seems like feminism for feminism’s sake, and it’s not even interesting feminism. So, here’s the plot (with minor spoilers). The Incredibles and Frozone make such a mess of things taking on the Underminer (the villain who appears at the end of the first film) that the government shuts down its super-hero relocation program. The Parrs are stuck in a motel for two weeks, which was the best Rick Dicker could do for them. Then, out of the blue, the Devears appear with a plan to save all supers. They plan to recruit a hero to perform some well-documented acts of heroism to get public opinion back on their side. They choose Helen since Elastagirl causes less destruction than the guys. From there the story writes itself. Helen has some initial successes. She encounters the film’s villain (a secret entity called the Screenslaver). She defeats the Screenslaver. She finds something weird about the Screenslaver. She gets captured by the film’s real villain. Then it is up to Bob and ‘Zone to save her, only they get captured too. Then it’s up to the kids. And Jack-Jack. Apparently, Jack-Jack is the Incredibles’ ace in the hole since up till that point the bad guys didn’t know that Jack-Jack has powers. Minus the part about Jack-Jack (who was hilariously terrorizing his babysitter throughout most of the first film), this resembles the story arc in the original. But where in the first film, each of the characters have their moments of strength and insight, in the sequel only Helen and Violet make any real decisions. Yes, Bob and Frozone take their marching orders from the women and are totally fine with that. When the real villain is about to escape in the end, Bob and Frozone don’t even try to do something about it. Instead, they absurdly encourage Helen to, as if The Incredibles franchise has now become nothing but a feminist coming-of-age story. In the first film Dash cleverly defeats two helicopter-like aircraft while running on water and plays an important role in defeating the robot monster. Here, other than struggling with his common core math assignments and beating up one whole bad guy, he does nothing but what he is told. In the first film, it was Bob who first conceived of how to defeat the robot monster. In the second, the only thing he manages to defeat by himself is common core. It should be clear to all who watch The Incredibles 2 that when the man was the center of the story the women were treated realistically and with respect. But now that the woman is the center of the story, the men get nowhere near the same level of respect and behave quite unrealistically. Furthermore, the plot is predictable. Clever audience members should be able to pick out the film’s true villain long before the official reveal. 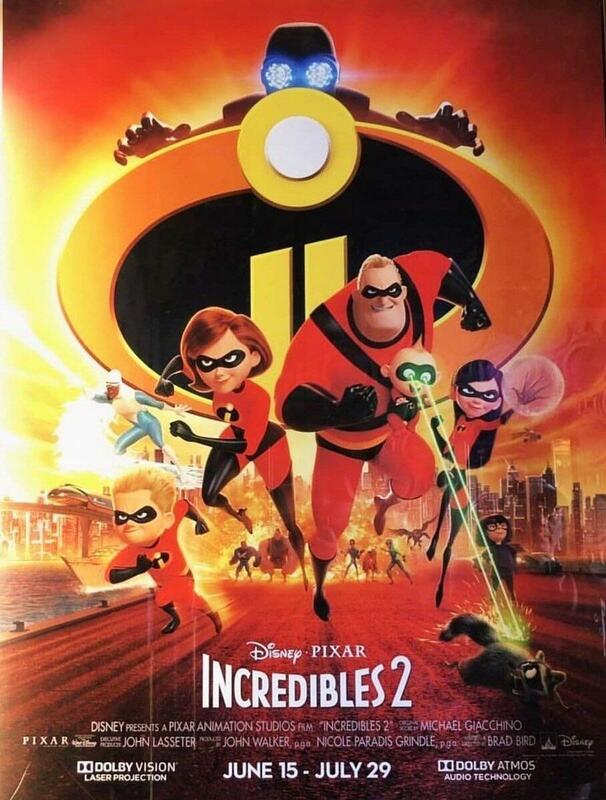 And from there, The Incredibles 2 becomes just a spirited re-hash of a thousand other super hero stories. If it’s your first superhero or Pixar film, you could do a lot worse. But if you have a few under your belt, you might as well skip it. Appropriately enough, The Incredibles 2 is about as much fun as kissing your sister. Published: June 29, 2018 | This entry was posted in North American New Right and tagged feminism, movie reviews, North American New Right, originals, Spencer Quinn, superheroes, The Incredibles, The Incredibles 2. Both comments and trackbacks are currently closed. There was one interesting moment in 2: there’s a scene in which Elastigirl is surprised to find that a bond she thought she shared with another woman, based solely on their mutual identity as women, was really just a means of her being manipulated by someone who hated her. Whether the point was a general criticism of identity politics or something more subtle is hard to say after only one viewing. I was annoyed by the multicultural background of the movie (but it wasn’t unrealistic, unfortunately), and the “global unity could be had if not for the nihilistic villain” theme. But I nevertheless appreciated the obvious, Boomer-tier message in Screenslaver. The 6 minute Fight scene in the incredibles was excellent however the warehouse battle in the movie “kickass” with Nicolas Cage exceeds all other battle scenes in contemporary films. The Incredibles was extremely subversive. The high school Violet attends is called Western View, the Jewish teacher who hates Dash because of his special abilities and the giant Spartans carved into the walls of Edna’s den….I love that movie. I wish I liked anything as much as you like this forgotten children’s movie from fifteen years ago.